As I patiently bide my time for Aunt Flo to arrive, and hence await our next IVF collection with our new specialist, I choose to distract myself with cooking and craft. I have had a wonderful weekend. 3 and half days off with my husband (a rarity for two shift-workers), dinner and drinks with new neighbours who are old friends, Elaine style dancing at a wonderful wedding of an old high-school friend, baking my first ever orange cake and damaging my thumb by modifying a pair of plain black gumboots. 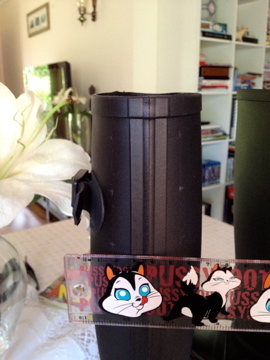 I had an awesome pair of gumboots with a fantastic skull and rose print that were originally from my Mum's shop. Unfortunately, they spent a little long time neglected in the backyard, where some mice decided they would make a rather attractive home. Needless to say, I couldn't really put my feet back in them after that. 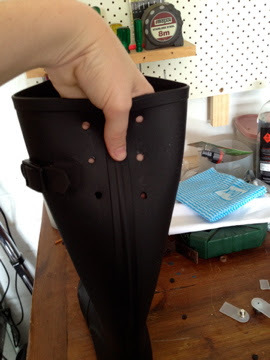 Motivated by the Pinterest Challenge, from my favourite blog Young House Love, I decided it was time to craft myself some funky corseted gumboots to help motivate me to take back control of my terribly neglected and over grown garden. After all, a girl needs to garden in style! The picture doesn't really do the total and utter cute-ness of these boots justice. I was hoping to get Adam to take some photo's of me in them, in action, in the backyard - but alas I took too long and the boy was at work before I was finished. Pack of Eyelets with accompanying tools. 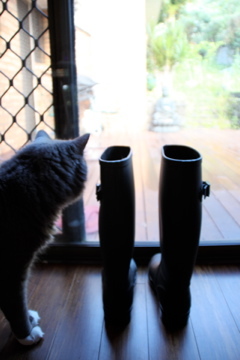 I bought my Gumboots for under $20 at Big W. They come in a range of sizes, and can be found in the women's shoe section. 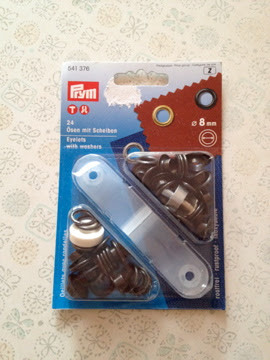 I bought my eyelets from a local fabric and craft store. I chose the size 8mm, and colour black. Other colour options are usually gold and silver. Use a solid work surface. I used Adam's work bench in the garage. This tutorial requires plenty of hammering, and you don't want to do any damage! Measure and mark where you want your holes. I used a ruler and a lead pencil to mark where I wanted my holes to be. I did them 3cm vertically apart. Given my time over, I probably would now do a 4-5cm gap. 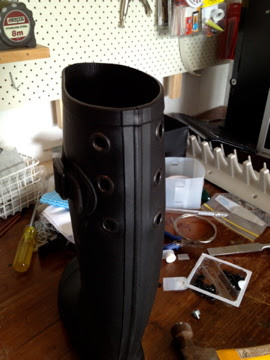 But its up to you, and what you think will look good on your boot. I also chose to do 3 on each side. Depending on the look you want, you may wish to add a lot more. 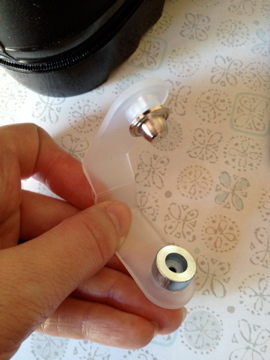 Follow the instructions on your eyelet packet. You can see the tool and attachments that came with mine above. 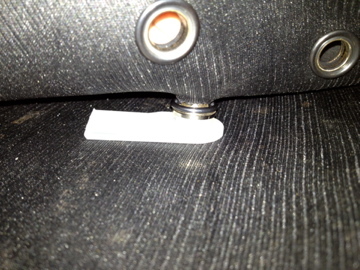 It is essentially a hole punch. Line it up where you want it, and hammer until you have a hole! 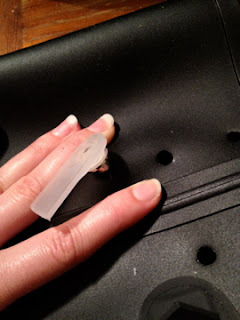 As you can see from the photo's above, I chose to cut my plastic tool in half to allow the punch to reach further down the boot. 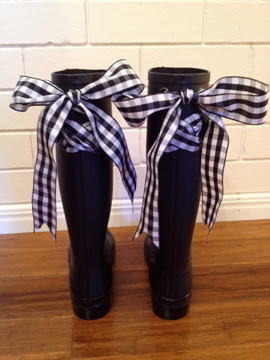 The tutorial from which I originally borrowed this idea, chose to cut down the back of the gumboots. It's a great option for girls who find the gumboots too tight on their calves, and would probably make the whole hole punching process a lot easier. 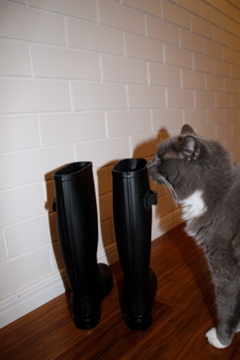 I chose to keep my gumboots in tact, as they fit just right. 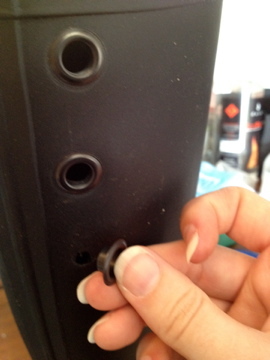 Yes, my bottom holes are terribly mis-aligned. I didn't realise that I had accidentally moved the punch. Word to the wise - don't get distracted by your ridiculously cute cat! Nothing I could do about once it was done. Thankfully, the ribbon hides it pretty well, otherwise it would drive me batty. 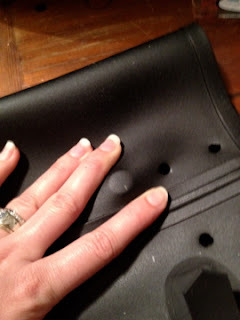 Depending on the eyelets you bought, it may be a little different... But I will show you how mine work so you can better understand the concept. 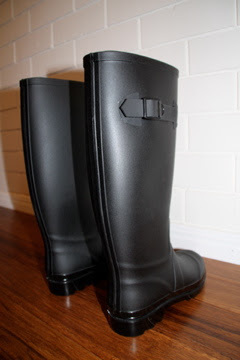 The main eyelet piece is the one that looks more like a hat, it is what should be on the outside of your gumboots as it is the most attractive. 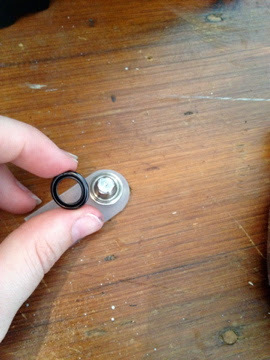 The washer looks like a flat ring and goes on the inside where it cannot be seen. 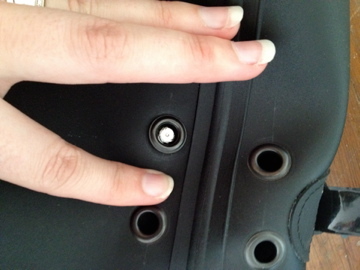 Take the eyelet piece (above) and push through your pre-made hole. Next comes the positioning of the washer, and the tool, which is best explained through song... I mean pictures! Once in position give it a bunch of good whacks with the hammer. 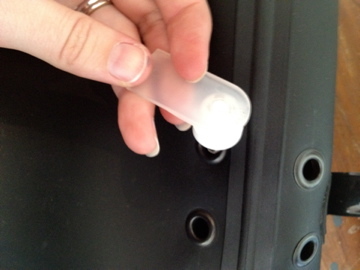 Remove the tool and check to see that your eyelet looks and feels secure. Yes I have fabulous new hole-punching, eyelet pressing skills. Add it to the list, it's only going to get longer! 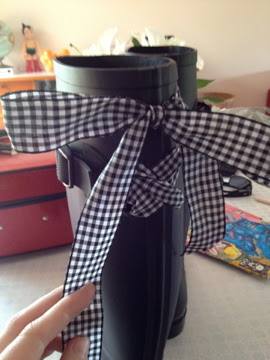 Thread your Ribbon and Voila! Ok. So it wasn't that easy for me... because as a self-confessed bulk-buying hoarder-holic, and currently having an obsession with gift-wrapping... I have A LOT of ribbon. I was feeling indecisive and kept threading and rethreading different types, widths and colours, trying to work out what will look best. Of course I always have my substitute child handy to give me a helping hand paw. 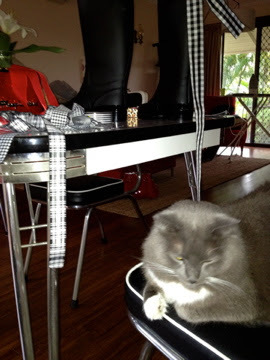 Here he is personally inspecting the boots during their 'before photo shoot'. Here he checks that no waterdragons will mischievously walk into shot. 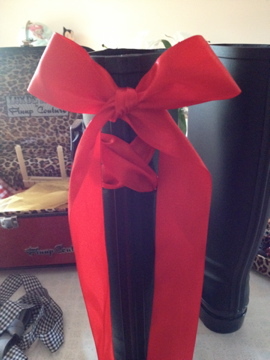 And here he is jumping in my grave during the ribbon selection process. Seriously. I got up to get water, and he had highjacked my seat. 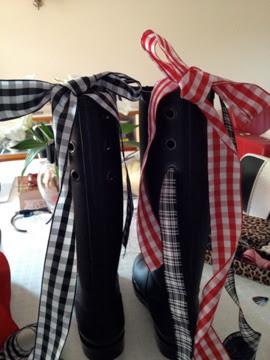 In the end I decided on a black and white, large gingham-ish ribbon. 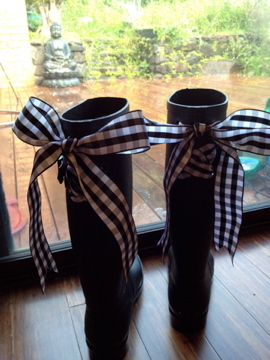 But I figure I can easily change it up when I feel like a new look, or when the ribbons end up full of farmers friends. Looking back through my trial pictures, the plain red is looking pretty spectacular... it's definitely next on the list! Hope you all had a weekend as wonderful as mine! You can find the original pin from Pinterest here, and the tutorial it links to here.